Facing criticism for not acting against big encroachers in its demolition drive, the Ludhiana Municipal Corporation is now concentrating on some alleged rich and influential defaulters, who had encroached upon public hand. Just 48 hours after a woman killed her two children and then committed suicide in New Anand Puri colony, her relatives, including her parents, in-laws and husband, have blamed her for quarrels in the family and held her responsible for the death. 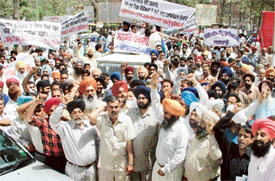 The Punjab State Goods Transport Association today staged a demonstration to express its resentment against the alleged harassment suffered by them at the hands of the police and officials of the Sales Tax Department. Protesting against alleged excesses at the hands of personnel in the Traffic Police and Transport Departments, tempo and truck operators’ unions today held a protest march here and submitted a memorandum to the Deputy Commissioner (DC), Mr Anurag Verma. The District Health authorities raided a private clinic in Sahnewal yesterday where midwife, Ms Gurpreet Kaur, was allegedly performing an abortion in violation of the provisions of the Pre-Natal Diagnostic Test Act 1994. Improved management and combination of several therapies might bring a new ray of hope for cerebral palsy patients, till now considered incurable, if the trials conducted by a New Delhi-based NGO — Udan for the disabled — are any indication. Dr Ujagar Singh Walia, Sr Agronomist (Weed Control) from the Department of Agronomy, Punjab Agricultural University, has been selected as fellow of the Indian Society of Weed Science for 2004-05 for his contributions in the field of research, teaching and extension. Fruit and vegetable commission agents will meet the new Chairman of the Mandi Board, Mr Sukhbinder Singh Sarkaria tomorrow at Chandigarh. “We would talk to him about our problems due to the decision of privatising collection of fee,” disclosed Mr Amarbir Singh, general secretary, Punjab State Fruit and Vegetable Commission Agents Association. Fruit and vegetable commission agents, he informed, would also meet on April 15 to draw up strategy on the issue. Residents of several colonies and villages today protested against the installation of a gate on an unmanned level crossing on a 16 feet-wide road instead of 66 feet-wide stretch in Shaheed Karnail Singh Nagar here. An eerie silence prevails in this village as a large number of residents are camping in Ropar , Patiala and Sangrur districts along side the Bhakhra Canal in search of the bodies of the five missing family members of the village sarpanch Kesar Singh. The police have arrested three persons from the Military Camping Ground on Sunday night. Two persons fled the spot. According to the SHO City police station, the raid at Military Camping ground was made following a tip out of that some armed men are planning dacoity. Harisingh, Buta Singh, Narinder Singh and Bakhtawar Singh all of Dhalian village, assaulted Harbhajan Singh of their village with sharp-edged weapons. In a mad pursuit of meeting their targets, some leading multinational banks do not mind making tall commitments which they later fail to meet or simply refuse to fulfil. 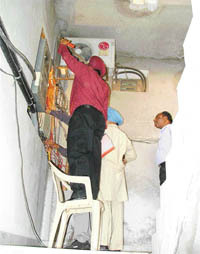 One customer Mr Gurinder Grewal learnt it the hard way. However, had he not been a little alert, he could have been lured by the tall claims and regretted later. Ultimately he decided to get his loan, which had been sanctioned to him, cancelled. Nearly about 78,170 quintals of wheat crop arrived in mandi here yesterday. 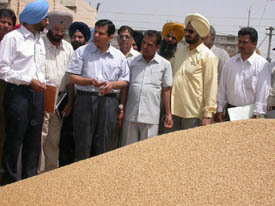 Government agencies including Markfed, Punsup, Punjab State Warehouse, Punjab Agro and various private agencies purchased the crop, said Mr Harpal Singh Dhillon, chairman of the Market Committee here today. A “Career Smart Workshop” was organised by an educational institute, imparting training to IX and X students in science and mathematics, at BCM School, Shastri Nagar, here yesterday. Prof Ashwani Bhalla of SCD Government College here attended an international conference on “Environment and development: developing countries perspectives” at Jawahar Lal Nehru University, New Delhi, on April 7 and 8. He presented a paper “Corporate social and environmental responsibility: a conceptual model for Indian corporate sector” in socio-environmental aspects. Kundan Vidya Mandir is one of the oldest schools of the city . 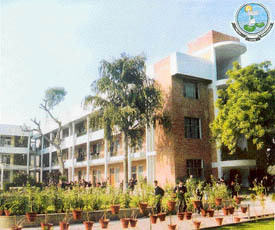 It was the first school of Punjab to get affiliated to the CBSE in 1963. The school has a strength of more than 4,000 students in its Civil Lines branch and 883 students in the city branch. It has a staff of 226 members. It was the vision of Rai Sahib Kundan Lal, founder, to impart liberal education to students who were committed to the ideals of nationalism, secularism and democracy. Education should lead us to achieve overall development of the child in a tension-free atmosphere. A school is not a workshop where people get together to labour and receive wages in the form of certificates. Rather it is a temple of learning wherein the young worshippers and the priests appointed to administer intellectual knowledge are both alike, the adorers of the Goddess of learning and wisdom. It was a nostalgic evening for alumni of Dayanand Medical College and Hospital (DMCH) as they assembled at Dumra Auditorium to attend the old students’ meet here last evening. The meet was organised by the DMCH Alumni Committee under the umbrella of the DMC Old Students Association (DMCOSA). To celebrate its 52nd foundation day, Guru Nanak Dev Engineering College held its alumni meet yesterday. According to a press note, the meeting was attended by a number of old students who had come from far off places. Medical facilities in Pakistan, particularly in cardiothoracic surgery, are behind those available in India, and Indian cardiac surgeons and cardiologists were comparable with those in several developed countries. Indian superspecialists can help develop medical sciences in Pakistan besides treating Pakistan’s patients in this country. The Central Council for Research in Ayurveda and Siddha (CCRAS) feels that India has all the potential to become a global leader in health care if the science of Ayurveda is revived and revitalised with the help of modern science and technology. More than 1000 patients were examined by specialists at a medical camp organised by the Masihi Ekta Dal at Temple of God Church in Salem Tabri here today. 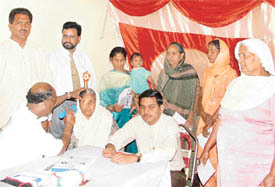 Pastor Sultan Masih, chairman of the body said nearly 1500 persons had registered for check up for dental, eye, ENT and other diseases. A doctor examines a patient at a medical camp organised by the Masihi Ekta Dal in Ludhiana on Monday. — Photo by I.V. Allround performance by Karan Goel ( 4 for 38 and 47 runs) and an equally valuable contribution of 55 runs by Rajesh Gandhi helped Municipal Corporation XI to register 12-run win against FTI Club in a cricket match played at the Satish Chander Dhawan Government College ground here yesterday.